WASHINGTON (AP) Anibal Sanchez can earn an additional $2 million in bonuses for starts in each of the next two seasons as part of his $19 million, two-year contract with the Washington Nationals, a deal that could be worth $33 million over three years. Sanchez has salaries of $8 million this year and $9 million in 2020 under the deal announced Dec. 27, with $2 million of each year's salary deferred until Jan. 15, 2021. The Nationals have a $12 million option for 2021 with a $2 million buyout, and the buyout would be due on Jan. 15, 2021. In both 2019 and 2020, Sanchez would earn $500,000 each for 18, 22, 26 and 30 starts. 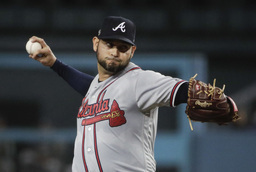 A right-hander who turns 35 in February, Sanchez boosted his appeal with a comeback season for NL East rival Atlanta and joins a revamped Nationals headed by Max Scherzer, Stephen Strasburg and Patrick Corbin, who agreed last month to a $140 million, six-year contract. Sanchez was 7-6 with a 2.83 ERA in 24 starts and one relief appearance last year with 135 strikeouts in 136 2/3 innings. Sanchez struggled in 2017 with a 6.41 ERA with Detroit.